Do Space Scientists Dream of Cosmic Reproduction? Individual scientists will dream of many things, but what are the collective fantasies that tie them to the stars, and us to them? Star Trek, Star Wars, Battlestar Gallactica, and other popular series were all structured by the discourse of empire. Whichever side you, or the emperor, were on, the template was political. Expansion was a given, hubris the constant danger, and some combination of classical virtues such as prudence and courage the key to winning in the long term. But for all the superficial similarities involved in “the conquest of space,” that really wasn’t NASA. My point is not to make a joke. Nor is it to state the obvious, which is that there always has been an all-too-obvious phallic dimension to the whole rocket thing. (Something to which this post obviously is not immune.) Perhaps the amateurism of the photograph can help, for the glare of the window makes the image seem a bit like a specimen under glass. The shift in the spectator’s standpoint also matters: for once we are looking down on the launch, which also is placed against the wide horizon of the planet rather than above those few able to stand and look upward at Cape Canaveral. These and other features of the image combine to miniaturize what had been a long-running media spectacle. That change in magnitude allows a hidden drive to become visible. Whatever the idea behind the space program, the dream never was to get most of us up there. The “space truck to nowhere” made that realization all too clear. Gravity is our lot. But reproduction is not about getting most of the adults through nature’s bottlenecks. Instead of conquering the stars, perhaps the real drive is to seed them. Still all too masculine and likely to be doomed for that reason, but now at least one can grant that the humans really weren’t serving the machines. The dream, the image suggests, was to get just one pod through to some unknown egg. Humanity wouldn’t conquer anything, but if it was found by the right host, some version of the species could spread across the galaxy. This rumination is crazy, of course. But then the space shuttle program was crazy: an unbelievable feat of engineering that had minimal scientific value for the enormous amount of money expended. Rather than letting it become merely a museum piece, perhaps photographs such as the one above can buy a moment’s reflection. Even though the smart thing is to focus on living long and well on this planet, the space program’s inversions of magnitude can reveal not only the smallness and fragility of human life, but also how our primitive urges can lead to dreams of almost infinite extension. Photograph by Stefanie Gordon/Associated Press. It accompanied this essay in the July 5th New York Times. 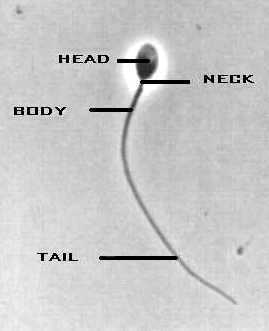 The sperm diagram is from a histology course. Interesting post. 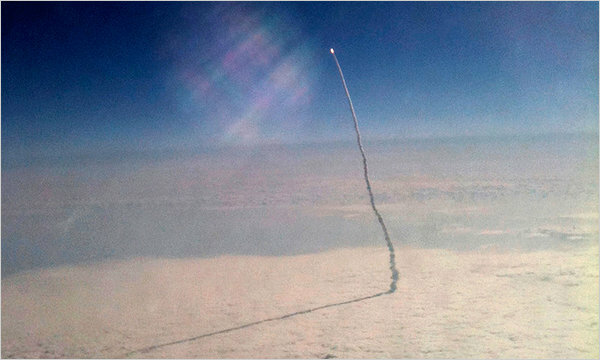 I just saw another image with a similar p.o.v., except this image was of Atlantis’ launch and not Endeavor (link below). Perhaps I don’t follow NASA closely enough, but the p.o.v. of these images strikes me as rather unique. I’m always used to shuttle launch photographs looking up at space, and not down on earth. To build a little on your analysis of p.o.v., I think that another meaning may be found in the photo of Atlantis’ launch. By showing the earth and not the “wild blue yonder,” this image of Atlantis de-emphasizes space in the viewer’s imagination. This seems particularly apt since this is NASA’s last space shuttle program launch. Indeed, the smoke seems to tether the shuttle to the Earth. It might be interesting to see if a downward p.o.v. has been employed more since the program’s end was announced. btw, glad to see more posts!